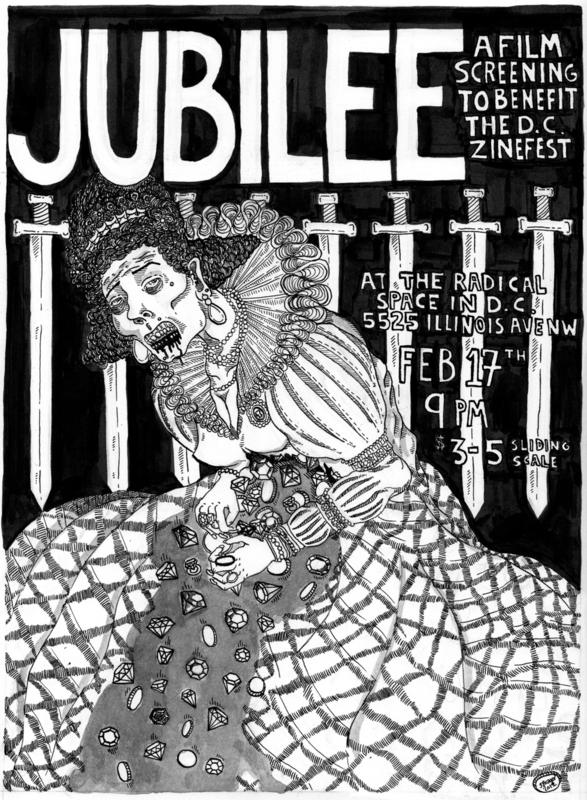 Come support the 2nd annual D.C. Zinefest and celebrate the beginning of the end with a screening of Jubilee, the 1977 apocalyptic girl gang cult classic by Derek Jarman! From Wikipedia: Queen Elizabeth I is transported forward in time by the occultist John Dee through the spirit guide Ariel. Elizabeth arrives in the shattered Britain of the 1970s. Queen Elizabeth II is dead, killed in an arbitrary mugging, and Elizabeth I moves through the social and physical decay of the city observing the activities of a group of sporadic nihilists. Numerous punk icons appear in the film including Jordan (a Malcolm McLaren protégé), Toyah Willcox, Nell Campbell, Adam Ant, Demoriane and Wayne County. It features performances by Wayne County and Adam and the Ants. There are also cameo appearances by The Slits and Siouxsie and the Banshees. The film was scored by Brian Eno.